The Minister of Information and Culture, Lai Mohammed, has said Acting President Yemi Osinbajo gets in touch with President Buhari every day. 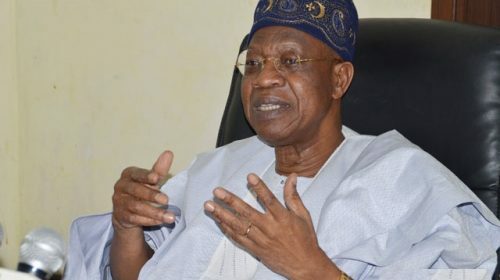 Lai Mohammed statement about the health of the president contradicts speculations that President Muhammadu Buhari may have died. He said this in Lagos during an interview with Seun Okinbaloye of Politics Today on Channels Television. According to the minister, Buhari has “so much trust” for Osinbajo and also enjoys his maximum loyalty and confidence. Asked if President Buhari is in support of the meetings the Acting President is having with leaders of the North and South East amid growing tension in both regions, the minister said there is no concern about that. On the calls for the restructuring of Nigeria, Mohammed said that was not a priority for the government. He added,“I have said at several fora that the priority of government right now is to keep this government one and safe. “The priority is to revamp the economy and the priority of this government right now is to ensure that we fight corruption and that we put this country on a very stable footing. It could be recalled that British politician and former military officer, Eric Stuart Joyce, stirred up controversy over the health of President Muhammadu Buhari when he challenged the President.